When Nebraska and Minnesota meet on Saturday, it will be the 57th all-time meeting between the two programs. Talk about quite a bit of history. Beyond that, since Nebraska joined the Big Ten in 2011, the Huskers have won three games against Minnesota, while the Gophers have won two (back-to-back in 2013 and 2014). Needless to say, there's a lot of potential on both sides of the ball come Saturday. To get a better understanding of what Husker fans should expect from Minnesota, we reached out The Daily Gopher. 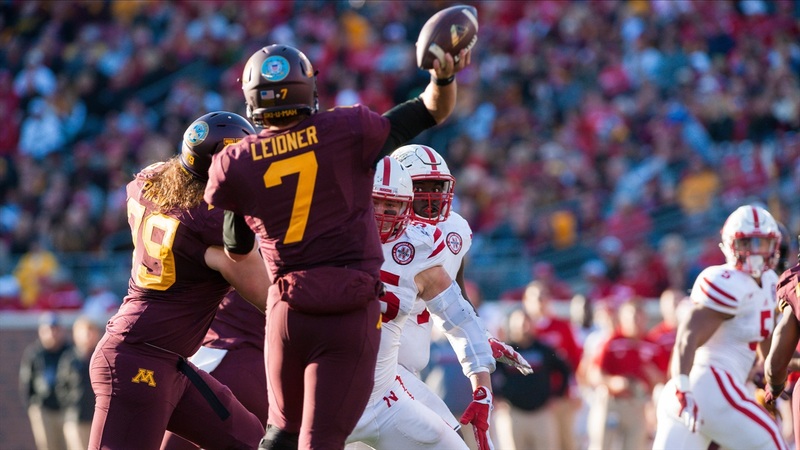 Tom, who goes by 'Gopher Nation' on the site, shared a little on Gopher quarterback Mitch Leidner's role as a leader, as well as what Husker fans can expect from Minnesota's defense. Q: Similar to Tommy Armstrong Jr., Mitch Leidner has been at the helm of his team since 2013. How valuable is he to the Gopher offense? T: That's a good question and even as I am one of the people left on 'Leidner Island,' I don't think he is super "valuable" to this offense. I mean, I'd much rather have him under center each and every game and I think he brings a lot of leadership to the offense but considering how this team is based primarily on it's rushing attack, Leidner's value is diminished a bit. Don't get me wrong, he is generally a good decision maker and his leadership on the offense is unquestioned. He is valuable to the offense but this team did go on the road and beat Maryland with a walk-on quarterback starting the game. If I were to compare the two programs, I would say that Armstrong's presence is much more important to Nebraska. Q: Speaking of Leidner, he's run into a bit of a four-game slump (and acknowledging one game he had to sit out due to a concussion). What's going on there? Will he bounce back against Nebraska? T: I believe that he will. He always seems to have a lull in every season but finishes very strong and he seems to play well against Nebraska. As a sophomore, he rushed for 111 yards, threw no picks and secured a win on the road. Last year was a loss but he did complete 65 percent of his passes for over 300 yards. He's a tough kid and I think he's got a couple good games left in him. This week would be the week to get back on track. He hasn't thrown a touchdown pass since October 1, but I expect that to change on Saturday. Q: Rodney Smith seemed to tweak his ankle during last week's game. Any concern there for Gopher fans? T: I don't think there is any real concern there. Shannon Brooks missed last week's game with a hip injury and having him back at full strength would make me feel better, but I don't think there's any real concern about Smith who is having a breakout season. Q: What is one part of Minnesota's defense that Nebraska can take advantage of? T: The secondary tends to give up big pass plays. The run defense is quite good and there is some talent in the secondary but they tend to give up a couple big plays in games. I am not familiar enough with Nebraska's passing game to know if that is something they can take advantage of but it tends to happen. Q: Minnesota goes into this game 7-2. How likely is it that this team beats Nebraska and then finds a way to win the West? T: I think that the Gophers have a chance. Nebraska is favored and I'm not overly confident coming into this game, but I don't think this is unwinnable. The Gophers have not played a game this year where all three phases played well. The offense was good against Penn State but then the defense had probably it's worst game of the year. Against Iowa, the defense was very good but the offense was awful. The rest of the Gophers' wins, they could get away with that. To beat Nebraska, and eventually Wisconsin, they'll have to play well in all three phases. I don't believe that Nebraska is so superior that the Gophers need to play a "great" game, but they need to play well without making costly mistakes. Winning the West is a pretty steep challenge, so I'll be happy with a win this week and keeping Minnesota's chances alive for another week.